Landowner Bob Tomlin (center) discusses the project with RCD executive director Chris Coburn (left), Board Member Howard Liebenberg (right) and Associate Board Member Kathryn Tobisch (background).Since childhood I have loved spending time along streams and rivers, hiking, camping and seeing the fish, frogs, turtles and birds and as an adult fly fishing for trout in the Sierras. Retiring on property with a year around stream (Soquel Creek) flowing thru it was a dream come true. Soon after moving in I took an exploratory hike for a mile upstream and was surprised at how few fish, frogs and turtles I saw; 10 medium sized frogs, one trout (6” long), one sculpin, one squawfish, no turtles and very few “fishy” looking spots in a mile of stream. Our particular quarter mile section was generally barren looking with only a couple of pools, mostly long, straight and shallow sun bleached stretches with the gravel and cobble bottom heavily silted in the lower half. I thought to do some type of modest manually constructed stream bed alterations to create some pools, refuges and shade for fish and amphibians and began asking neighbors for referrals to a stream habitat expert that could give me some advice on what to do. I was referred to the Resource Conservation District of Santa Cruz County which turned out to be the best advice I could have received. From their first exploratory visit thru completion of the project construction, I was impressed with the depth of in-house experience and outside resource contacts they were able to bring to bear on identification of the problems, getting a feasibility study and design accomplished and funded and managing the funding and construction phase of the project. In the months of study and design I was favorably impressed with the attitude and experience of the individuals from the RCD, contractors and consultants that managed and did the work on the ground, as well as people from permitting agencies and funding organizations that came on site to evaluate and advise on the project. All seemed knowledgeable and motivated to see a good end result in the stream. In the past, I did some real estate developments large enough to involve multiple permits and the hiring of project managers. In that situation I sometimes felt the permitting agencies were obstructionists and the project managers were not quick enough to anticipate problems and come up with solutions instead of kicking the problem upstairs. In this case, I felt the county, regional, state and federal agencies were on our side and the RCD’s project management was the best in my experience. Our whole riparian corridor already looked more natural on the day construction was completed, just with its straw covered slopes. Removal or burial of over a thousand tons of glaring white riprap, regraded stream banks to more natural contours, realignment of the stream channel away from the silt generating cliff face and the placement of redwood logs and rocky barbs adding complexity to the stream channel were already showing promise of a much better habitat. Our first big rain of 2 ½ inches showed the new structures were functioning as hoped. The new backfill bench in front of the dirt cliff caught a half dozen dump truck loads of dirt that would have fallen in the stream. Redwood root wads and rocky barbs all created many new eddies, respite areas and stream diversions beginning to carve holes and redirecting stream flow to a more sinuous shape. 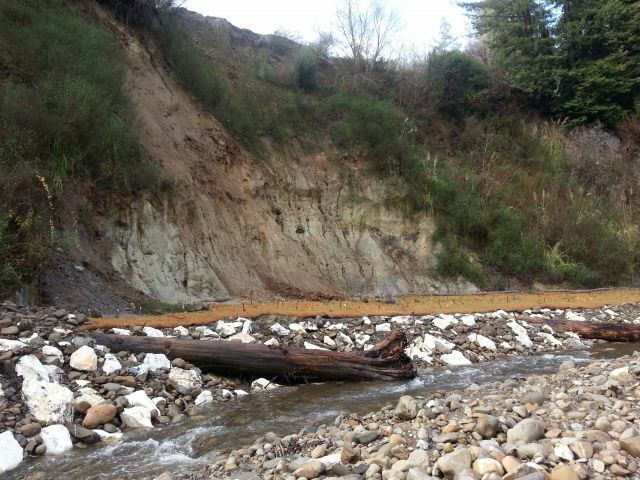 The new flood overflow channel began functioning with a three foot water rise, slowing water velocity pressure and diverting water away from a 90 degree turn at the base of the dirt cliff as planned. It’s only going to get better as all the newly planted vegetation has time to grow and mature and the water continues to carve new holes and complexities around the wood and rock structures placed in the stream. All in all a very successful and satisfactory result from my point of view. I plan to invite all my neighbors downstream to come see the project and ask if they would be interested in getting advice and help improving the riparian habitat in their sections of the stream. 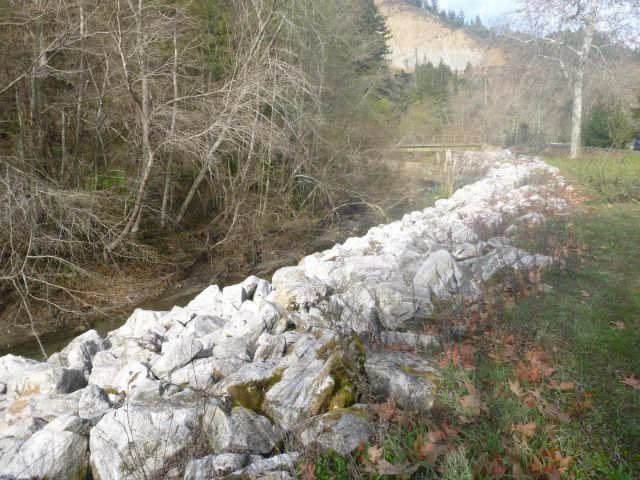 Large rock placed in the streambank inhibited the growth of riparian vegetation, which negatively impacts our local steelhead population. 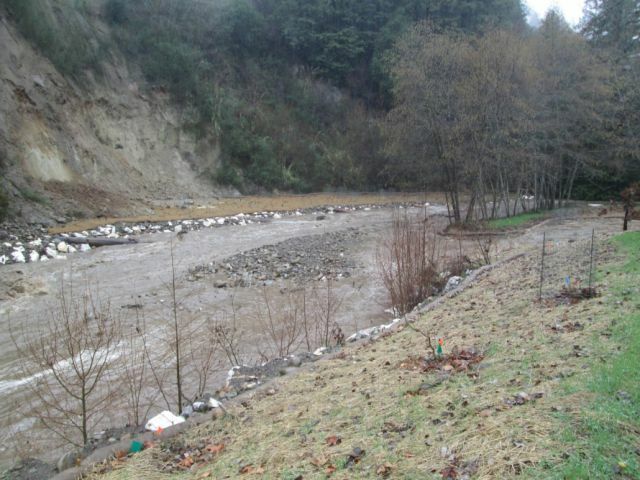 The photo on the left (October 2015) shows the completed construction of a “bench” and placement of large redwood logs to protect the toe of the slope of the landslide, allow floodplain activation, and provide refuge from high velocity flows for Coho salmon and steelhead moving upstream to spawning areas. The same bench location in January 2016 under high flows. Note the debris slides captured on the left end of the bench. Bob Tomlin and his wife live along Soquel Creek in the Santa Cruz Mountains.